I had a dream last night that I watched a secret Stanley Kubrick film that hadn't been released yet and had just been newly discovered. It was disturbing, provocative, and weirdly humorous. In other words, awesome. I felt so sad to wake up and realize it was only a dream. It made me think of Neil Gaiman's Sandman and the library of books that writers had only dreamt about but never actually written. It would be awesome if there was a film archive from the dreams of films that directors never got to make. What about a vault of games from sequels that were only designed in dreams? Here's some of the more obscure RPGs (and action RPGs) I loved that I wish had sequels. 3D Dot Game Heroes: Killing enemies was never so satisfying as using a sword the size of the screen. The development studio behind the toughest videogame in the universe, Dark Souls, paid tribute to Zelda and created a polygonal Hyrule called Dotnia. Even though the retro nostalgia imbuing the game made it feel familiar, From Software injected fresh gameplay elements, particularly with the combat, that made it feel like a distinct retelling of the Heroes Journey, albeit without green tunics and the Master Sword. A sequel branching out with more of its own identity would be as striking as one of those gigantic blades sweeping enemies into oblivion. The Legend of Dragoon: Final Fantasy VII was awe-inspiring; Suikoden II made me cry; Wild Arms had me whistling its opening theme; Chrono Cross caused me to meditate alternate dimensions; but it was Legend of Dragoon that fired my imagination. Taking place on a whopping four discs, it was a cinematic masterpiece full of tragedy, drama, and dragons. It also innovated on RPG gameplay in ways I found addictive. The battle system included the Additions Combat and Dragoon Transformation, but more importantly, it had more than one battle theme. The music actually changed. Only twice, but it's something I wish I could see in every RPG game as I get tired of grinding to the same music over and over and over and over. I have stopped playing renown RPGs because I can't stand the battle music. Dragoon wasn't perfect, but it felt like a unique stepping stone to what would have been a masterpiece, kind of the way Phantasy Star for the Master System propelled Phantasy Star II into fantasy greatness. Willow: The movie is a guilty pleasure. The lesser known NES game was one of my favorite games on the Nintendo. Developed by Capcom, it diverged from the storyline of the movie and integrated elements of traditional fantasy with its own strange spin. While it does borrow from Zelda (the same way the original film borrowed from the Hobbit), the animation, the darker visuals, the animated cutscenes, and the sprawling towns made it feel like one of the first successful conjoining of different mediums. This is a rare license game that was actually good. I remember borrowing it from Blockbuster and finishing it over a weekend, struggling to get to level 13 so I could turn Fin Raziel into a human. Last year, I walked into my local Blockbuster and was told it was the very last Blockbuster in all of California. I felt like I was in a mausoleum to old films and games that were on sale for half price. I longed for Willow 2. The Battle of Olympus: While some may dismiss this 8-bit romp through Greece as a Zelda II clone, it had one item that made it sublime. The Hermes Sandals which I used to flip upside down and walk on the ceiling, then flip back down to evade enemies. The motion was so fluid, so useful, and so easy to execute, I played the game just so I could fly up and down across the eight areas. Of course, the RPG elements, the exotic locations, the powerups from the gods, and the mythic boss battles enchanted my childhood. A part of me was disturbed by the implication that the conflict behind the game was all the result of some of those Greek gods getting bored and wanting to stir things up, a divine joke of sorts. Later, in God of War III, Hermes meets a brutal end with his legs getting chopped off while Zeus gets annihilated. Unlike Orpheus, desperately searching for his girlfriend, Kratos didn't take lightly to jokes. Faxanadu: I remember when I first received this game, I wondered, what the hell is this? The cover was a boring crest with a big tree on it. Little did I know I'd stumbled onto the roots of one of the most epic Nintendo games ever created. Taller than the Hyperion (a coast redwood tree that is 115 meters tall), the world tree is the home of a battle between dwarves and elves manipulated into conflict by a villain with one of the most creative names ever, "The Evil One" (in case you weren't sure who the bad guy was). Rather than garish, cartoony colors, the presentation was more subdued, paralleling the disintegration of both the tree and society. If plants had ghettoes, Faxanadu exemplified the dark moss of decay. In a bittersweet ending, the unnamed hero walks away from the Paradise he's helped recreate, restlessly searching for his next adventure. Sword of Vermilion: Books usually stick to one perspective; first person (I, me, or we), second person (you), or third person (he, she, they). Sword of Vermilion shed all tropes and formed a trinity of game modalities, having first person dungeon crawling, second person side scrolling boss battles, and third person tiled real time combat and town navigation. I loved the story of Sword of Vermilion, the experimentation of the gameplay, and the music. My friends waged ferocious debates on whether the Genesis or SNES was better and I can name games from both sides that were amazing (Phantasy Star II, Secret of Mana, Final Fantasy IV and VI, Chrono Trigger, Shining Force, Shadowrun, even Super Hydlide). But Sword of Vermilion was the only one of my favorites from either console that didn't get any sequel love. 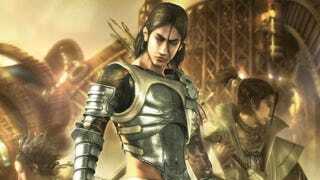 Lost Odyssey: About an hour into Lost Odyssey, I realized what I loved so much about the game. It was basically the old Final Fantasy's with a different name that also incorporated features from one of my favorite series, Shadow Hearts. Not a big surprise since it had Sakaguchi and Uematsu at the helm leading developers at Feelplus who helped create Shadow Hearts. A sense of melancholy permeates in this immortal's odyssey throughout time, reminiscent of one of my favorite TV shows, The Highlander. I missed the feel of games created by Sakaguchi with music by Nobuo Uematsu, and this game filled that void. While I have high hopes for Final Fantasy XV, especially if it is as good as it sounds, I also hope Mistwalker makes another Lost Odyssey. These were just some of my selections, inspired by my weird dream. Would love to hear any of the more obscure RPGs that have never had sequels that you wished did.